It was back in 1940 that the Hungarian born conductor George Szell orchestrated Smetana’s String Quartet No. 1 in E minor, ‘From My Life’ and later, in 1944, he included the piece in his debut with the Cleveland Orchestra. Within two years Szell was asked to become the orchestra’s music director and he held the post until his death in 1970. Szell and the CO recorded his Smetana orchestration for Columbia in 1949 and presumably they gave live performances of the piece from time to time. But it is only with this BBC Symphony Orchestra concert that the Szell/Smetana symphony – surely comparable with Ravel’s orchestration of Mussorgsky’s Pictures of an Exhibition – has finally reached the Proms. Szell believed that, for instance, the numerous great arpeggios in this quartet prove that four instruments were not enough for Smetana to express his musical thoughts. Indeed, the first note of the original piece has the three upper strings play three-string chords each with subito fortissimo (sff). Szell’s arrangement utilises his brass section for this first note. Smetana himself gives orchestral indication for the second theme of his second movement (Polka). He specifies that this viola theme should be played quasi tromba (like a trumpet). The same instruction is given when, eight bars later, the second violin develops the theme. Szell has not changed any of the notes in the whole score. But he furnished Smetana’s harmonies and rhythms with orchestral colours which may be inherent in Smetana’s original score. By the time Smetana composed this quartet he was deaf for two years and he realised that his deafness was irreversible. The sudden piercing, long-held high E for the first violin towards the end of the piece – apparently representing the piercing sound which Smetana heard in his ear – is strengthened by the piccolo in Szell’s version (unless my perception of the piccolo was incorrect in the vast auditorium of the Royal Albert Hall). Szell’s version brought a very large BBC Symphony Orchestra onto the sage. They included five horns, two trumpets, three trombones, tuba, also several percussion instruments with four players plus the timpani player with his three instruments. In fact, this piece used the largest number of BBC SO players during the concert. They played with dedication and true professionalism; it was nice to have them back in BBC’s Prom season after some highly publicised appearances of guest orchestras. Jiři Belohlávek, the BBC SO’s departing Chief Conductor, guided his players with full respect for the score and without any histrionics. He secured excellent ensemble work and room was left for musical nuances (such as the lovely diminuendo by the first oboe on conclusion of the first movement, and the gentle touch in sensitive solos by first clarinet and first horn respectively in the third movement). Belohlávek also ably demonstrated Smetana’s humour (second movement) and the spirited dance rhythm of the last movement. Beauty and discipline characterised the orchestra’s rendering of this remarkable Smetana/Szell symphony. 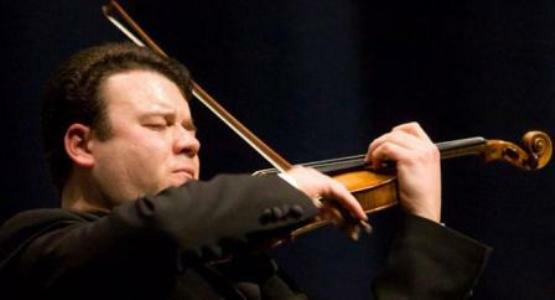 Violinist Vadim Gluzman plays the violin as if it was the easiest thing on the earth to do. He produces a beautiful cantilena violin tone – not even in passionate musical moments does he force the sound – and he delivers strong rhythms and virtuosity as natural components. Gluzman fully observes the musical score and invests it with nuances which cannot be notated but which reach the spirit of the musical content. Prokofiev’s violin concerto (No. 1, D major) starts with a violin solo over divided tremolo violas. Probably more for the sake of expression than for actual dynamic level, it is marked pianissimo for the violin. Gluzman managed to be soft yet easily audible and used tasteful agogics (that is very slight rubato within the bar) to express the spirit behind the notes. Gluzman’s ability to make his violin sing extended even to pizzicato passages. His energetic playing in the relentless, long semiquaver runs seemed natural (rather than laboured) and his double-stop cantilena solo towards the end of the first movement was perfect. Gluzman employed virtuosity, humour and discipline in the technically demanding second movement. In the final (third) movement the long sections of solo violin scale runs sounded like soaring but gentle songs over the rhythmic orchestral texture. The last five bars of the concerto, with clear and expressive rise of the solo violin (taken over by the flute for one bar) felt like rising to Heaven. One could not ask for more although Gluzman still gave a breath-taking performance of ‘Obsession’, the first movement of Ysaye’s second solo violin sonata. After the interval we heard Dvořák’s Symphony No. 7 in D minor. Belohlávek conducted from memory, the piece is clearly close to his heart. The orchestra responded magnificently. There might be many other interpretations of this symphony but none better. We witnessed the meeting of genuine art and professionalism at its best.